If you are planning to buy a quality property in Torrevieja, we can help. We have a wide range of townhouses situated in this popular resort just approximately 40 minutes south of Alicante airport. With new build townhouses starting from as little as 80,000€ you will be amazed what that can buy. We also offer second hand townhouses in one of the best areas in Costa Blanca South starting from 56,990€. These properties usually have 2 or 3 bedrooms, large terraces, spacious outside space and many of them offer a sea view from the solarium. 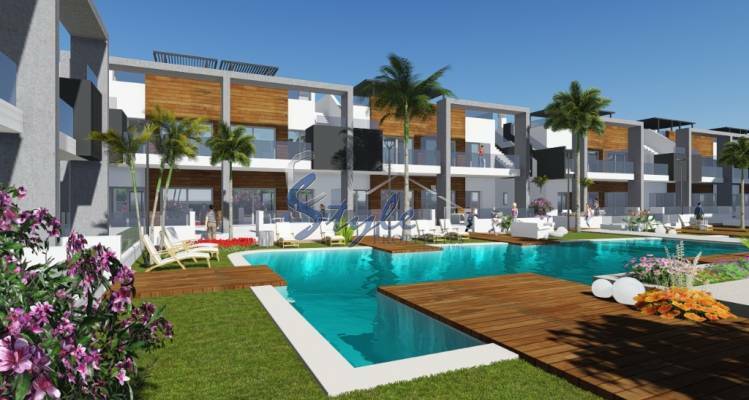 All of them are situated in private residentials with communal pools and gardens. When you buy a townhouse in Torrevieja you can be sure you will enjoy an excellent weather with more than 2,800 hours of sunshine each year and an average annual temperature of 19.3 degrees Celsius. You will also be just a short drive away from some of the best beaches in Spain, as well as an abundance of bars and restaurants, large commercial centres and leisure activities for the whole family.